According to several rumors, Google both smartwatches would be characterized by having a round sphere as design, of course with Android Wear operating system and offering integration with Google Assistant. Specify that images can be seen below have been recreated based on the idea that Google could have on its two future smartwatches, and therefore can not be final designs, since the Mountain View company is still in testing phase of these new wearables, so nothing can be taken for final. A few weeks ago we talked for the first time about two smartwatches based on Android Wear technology and designed and manufactured directly by Google: the code names are Angelfish and Swordfish. In the render that has been recreated we'd see the two different prototypes of which Google is considering the sale to the general public, and these may in fact be modified slightly or drastically before being offered for sale, and one of the two models (or perhaps both) can be removed from the roadmap of the company. One detail that does not appear in the render is that the screen does not end where the metal frame begins. At the moment there is no information about possible prices and release dates. 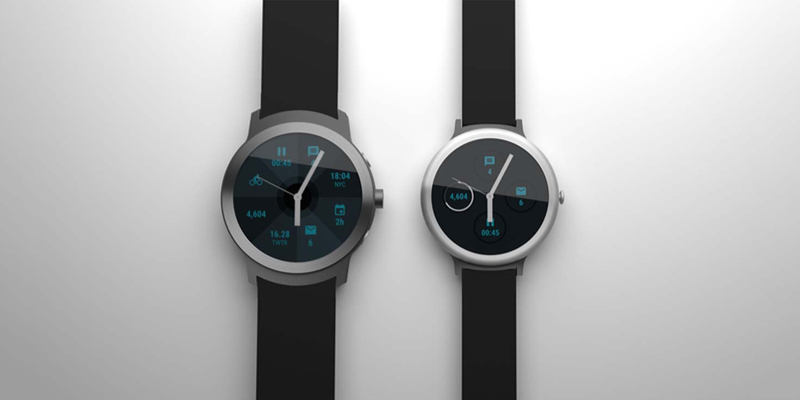 One of the most interesting informations in recent days, that was recently leaked, is that the Swordfish watch would be very similar to smaller Pebble (in particular, the model Time Round), which has a single button, but well prepared for interact with new intelligent systems for home and obviously with Google Assistant, the new virtual assistant by Google that aims directly to be compared with the efficiency of Siri and Cortana. Both products will highlight the capabilities of Android Wear, as is its 360° or versatility. Moreover, speaking of Android Wear, and after updating Google+, the Mountain View company continues to update its applications in order to introduce new features and improve compatibility with future operating system versions. This time it is the turn of Google Messenger, the application for managing SMS messages updated to version 1.9 with several new features. With the release of Android 7.0 Nougat closer, Google is slowly releasing new versions of its applications to improve compatibility with the future version of the green robot operating system. With version 1.9 recently released, and the introduction of compatibility with the new distribution of software in version 7.0, also restores support for smartwatches with Android Wear operating system.